My parents live on a farm and have a huge garden every year. I always hope to be visiting in late August or early September to get my hands on some of the cucumber bounty. 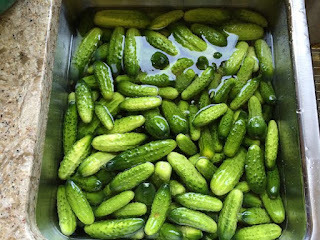 My friends and I made some dill pickles together a few years ago, and although buying the beautiful cucumbers from a local farmers market is wonderful, it certainly adds up quickly. Our pickle making was such a success that soon it became a tradition. She can't see anything go to waste! To make 15 quarts, I multiplied this recipe by 2.5 So in theory, this recipe should make approximately 6 quarts of packed pickle jars. Use as many cucumbers as you have or want to pickle and make your brine accordingly. Thoroughly wash and sterilize all of your equipment as you would when canning anything. (Including the measuring cup you'll be pouring brine with, and tongs that you will be using to lift your lids out of their water bath). Get your brine going by mixing vinegar, water and salt in a large pot over high heat. In warm jars, toss a couple cloves of garlic, and a sprig of dill (think the stalky seed part, not just the herb you're used to seeing in cooking. See photo below). Pack cucumbers on top. Put larger cucumbers on the bottom and save those tiny ones for packing spaces near the top. Pour boiling brine over top of packed cucumbers. Ensure you wipe the rim of your jars so that no salty brine mixture is there. Your lids won't seal if there is any spillage there. Add a sterilized lid to your jars and tighten a ring until it's just finger tight. Don't overtighten as the air needs to escape when the seal sets. I recommend having your lids sitting in a little pot of boiling water so they are clean, warm, and handy to just throw on your jars. The less heat you lose in this step, the more likely you'll get a good seal. Once they seal you can tighten the rings more if you like. 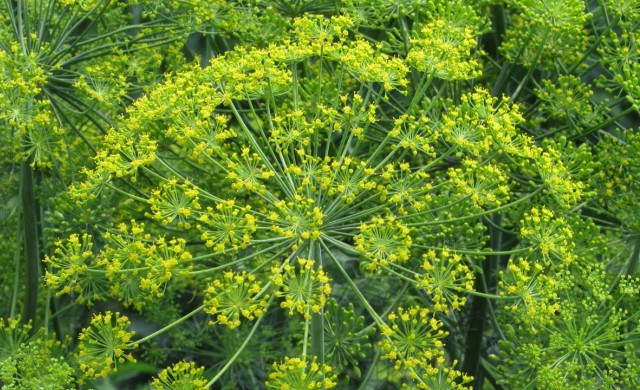 There are varying schools of thought on processing dill pickles. I am with the school of thought that sterilized tools and jars, boiling brine and copious salt with a good seal is sufficient. Boiling pickles in a water bath only serves to take away from the "crunch" factor of your pickles later because it essentially cooks them. Note, this is probably not the "official" word from any organized health organization, but do your own research and decide. I don't process, nor does my mom. Nor did my grandma. Or great grandma. A couple have died from old age. Not from bad pickles. NOTE: My thinking does NOT apply to other canned goods such as tomatoes and other non-salty things. Process that business. Definitely. I usually test the first jar in December or so for a batch made in late August or early September. 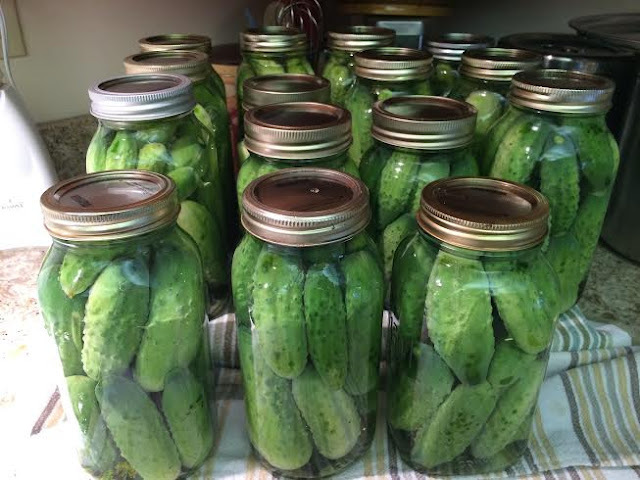 15 quarts of pickles all done and waiting for those seals to "pop". Once they cooled off, all had sealed. I got panicky because it took longer than usual....but all sealed!